The earnings results as noted by Apple on Tuesday's earnings call have evidently confounded stock analysis, a point reiterated by Jim Cramer on Wednesday. Here are a few of the remarks that some of the more notable prognosticators have made, following the report. AppleInsider will add to this article as we see more research notes and evaluations of the call. "This quarter was clearly about investors putting bookends around downside risks to Apple's iPhone unit volume outlook and the F2Q19 [March quarter] revenue guidance of $55-$59 billion managed to reassure investors that volume risks are largely priced in the shares at current valuation," wrote Samik Chatterjee. The analyst expects March quarter iPhone shipments to be down at least 20 percent, but "silver linings" in Q1 figures included a 62.8 percent gross profit margin on services, said to portend well for services becoming an increasingly valuable part of Apple's business. Chatterjee is maintaining an "overweight" rating for Apple stock with a $228 price target, but cutting full-year estimates for Apple's fiscal 2019, 2020, and even 2021, assuming lower gross margins created by "loss of volume leverage and higher promotions." 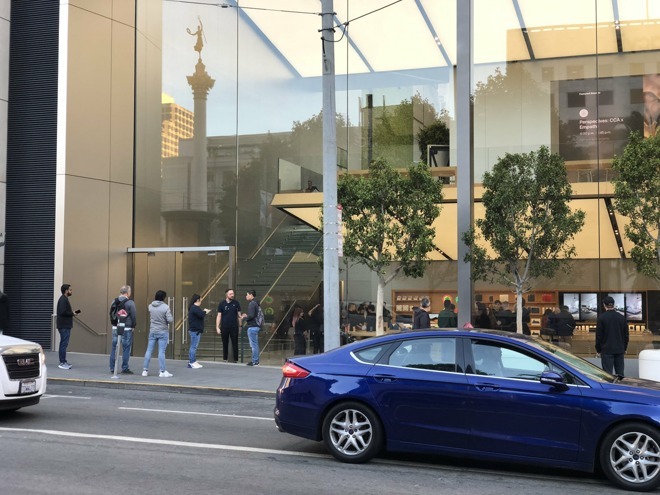 Results were "more or less" in line with expectations, the firm, said, adding that Apple executives "sounded upbeat and confident," for instance referring to "exciting announcements later this year." Macquarie took this to include the company's streaming video service, rumored to be launching by mid-April. The firm has high hopes for Apple's services business, but said it expects that to continue to slow, and see much of its growth come from lower-margin segments like video and music. "We expect Services to grow 18% y/y in '19 vs adj. 24% last year," it said. iPhone sales are "the biggest issue," it noted, arguing that reasons for weak performance given by Apple CEO Tim Cook -- China, exchange rates, longer upgrade cycles, and the battery replacement program -- may be exacerbated by "limited innovation." Macquarie is maintaining a "neutral" rating and a $149 stock target. Apple appeased analysts and investors since there was "fear that they could guide to a sub-$55 billion number," Daniel Ives told MarketWatch. The analyst was upbeat on services, noting that they still grew about 19 percent after normalizing for a change in revenue-recognition rules. "The line in the sand was [over] 60 percent gross margins [on services]," he remarked. "The services business may have been something [investors] were underestimating in terms of just how profitable it is." During the results call, Apple CFO Luca Maestri announced that the company has over 360 million paid subscriptions, three times that of last year. Ives suggests that Apple could top 500 million in 2020. Apple is in the "early phases of transitioning from [a] distributor to [a] content aggregator/provider," said Timothy Arcuri, pointing to video streaming and a rumored gaming subscription. UBS is reportedly "optimistic" for several other reasons, namely "the worst of the bad news" being over for a while, the profit potential for subscriptions, and iPhone replacement cycles nearing their limit. 5G support and a 2020 iPhone redesign should bring customers back, Arcuri said. The analyst is raising his stock target $5 to $185 with a "buy" rating. Walter Piecyk believes that Apple's forecast for between 37 and 38 percent in overall gross margin means profits won't sag alongside revenue. He did however cut his fiscal 2019 iPhone sales target by $6 billion, and lower his stock price target from $197 to $189. "Bottom line: no company can escape macroeconomic conditions, but Apple is successfully navigating the headwinds," said Gene Munster. "Despite a troubled quarter for iPhone sales, mostly in China, Apple's ecosystem is stronger than ever, and the company is positioned to return to sustainable mid-to-high-single-digit revenue growth in Dec-19 after what will likely be a 5 percent decline in FY19." The analyst echoed views that Apple is "becoming more of a services business," and that 5G cellular could draw people back to the iPhone in 2020. While other phone makers are beating Apple to 5G support, U.S. network coverage will be "negligible" in 2019 and early 2020, Munster argued. Do analysts ever explain how they come up with their “estimates”? As a retired person living on my IRA and Social Security I wonder how this all works. Seeing the blathering idiocy of analysts when it comes to Apple is not very reassuring to a small investor like me for my portfolio. I know I basically have to be in the stock market to have any chance of keeping ahead of inflation as interest rates on cash CDs are pitiful. I let Stifel Nicolaus manage my IRAs and pay them handsomely to do so but the roller coaster ride since 2012 (when I retired) has been quite a knuckle breaker. For every “Gloom and Doom" analyst there’s a corresponding “Unicorns and Rainbows” analyst. The two are 180° apart in their analyses so what’s a guy like me to think? I think the analysts and media don’t know what the word “innovation “ even means. Apple is one of the more innovative companies in existence. I don't have any new/better stock recommendations for you (nor do the so-called-professional analysts). Just sit tight and stay with AAPL. Despite all the silly "doom" comments on forums like this, Apple isn't going away anytime soon. But, as fun as all this political postering may be, we have other more pressing issues to deal with in the shorter and longer term. Short-term: Brexit (and it's effects on the world economy as a whole) deserves some of our US attention. Long-term: Shivering in Chicago, I'm thinking that the climate has radically changed (for the worst, more unpredictable) in my lifetime. It doesn't matter who has caused these changes, what matters is this: is there anything we can do to make a better future for our descendants. Your in good company with other 🍎 investors including Warren Buffet. Attended my first ever shareholders meeting last year by attending the Apple Shareholders Meeting at Apple Park, in the new Steve Jobs Theater. A memorable experience. Could not believe of the 1,000 attendees how many had their entire IRA monry in Apple stock. These analysts and financial reporters of all media types have a job to do by reporting what they think is important. Non of them are perfect. Deduce and find a common denominator with what they say. It is the day traders and institutional computer trading that sways the market with hugh ups and downs. Reinvest those dividends back into more Apple shares. Better than money in the bank which is making nothing. Think long term which is an over used phrase because it varies with each individuals situation. Nothing is a sure bet. But owning Apple is better than rolling dice or playing the ponies. Money in the bank is safe and secure but not paying Apple dividends. Am in the same situation as you. Last year I attended the Apple shareholders meeting at Apple Park and the meeting was held in the new Steve Jobs Theater. It was the first shareholders meeting held in the new facility and my first ever shareholders meeting anywhere. To say that it was a memorable experience goes without saying, like a kid in a candy shop. There were people in attendance with their entire IRA invested in Apple. These analysts and tech reporters have to write something to earn a living. I take it all with a grain of salt. If Warren Buffet is buying millions of dollars of 🍎 stock I can sleep well. Think long term and if you need some $ sell a portion. Let those dividends keep purchasing new shares. Keep reading and listening and look for common denominators. It is day traders and institutional computer trading that causes these high daily swings in the market. Investing in a dividend paying stocks is usually a good investment. Better than cash in the bank or cd which pays nothing. Cash in the bank is also a smart thing for 2-6 months of expenses.